ORLANDO, Fla. - Colonial Drive is closed near Interstate 4 through Tuesday morning as crews work on a bridge. The Florida Department of Transportation announced the closure on Sunday, giving short notice to drivers and few details on the reason of the closure. Colonial Drive is closed from Orange Avenue to Hughey Avenue. Steve Olson with FDOT said the closure is in response to several cracks found by engineers on a pier underneath a new section of the bridge a few weeks ago, when the bridge was set to open. Officials decided to hold off opening the bridge while they monitored the situation then this weekend they decided to to err on the side of caution and put in another level of security by adding the support beam, even though the bridge was structurally sound. Commuter Pam Grimmett, who travels from Longwood to take her daughter to school in downtown Orlando, was stuck in traffic Monday morning. "I actually had to go down Colonial to the right and turn down Paramore and then kind of navigate my way around it," she said. "It would have been nice to know (in advance)." The closed stretch is expected to reopen Tuesday, weather and circumstances permitting. Engineers will then begin to formulate a permanent plan for the pier. Olson said that could take several weeks. Once that work begins, he said there is a possibility the stretch between Hughey Avenue and Orange Avenue could close again. As to why the work isn't being completed during the overnight hours, Olson said this project has to be done in its entirety. 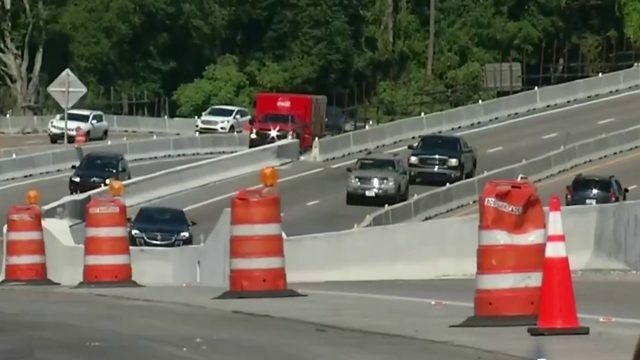 The closure is related to I-4 Ultimate, a nearly seven-year project that's overhauling a 21-mile stretch of I-4 through Central Florida. Typically, though, closures are overnight, but Colonial Drive will remain closed all day Monday and into Tuesday morning. Drivers are being detoured through downtown via Robinson and Livingston streets.